This is the death knell of interpreting as we know it. We have been dictated risible terms on a brand new contract set to cover all 12 hospitals in Bristol. Not by a flaky fly-by-night agency. Or a large corporate body with a language interpreting and translation arm. But by a well respected, long standing national agency founded by, owned by and led by BSL Interpreters. Initially when we heard that Sign Solutions had won the contract to provide BSL interpreters across both healthcare trusts in Bristol, we were optimistic. Until they told us the terms and conditions that they had negotiated for their business. When challenged about these, specifically the 24 hour cancellation condition, we were told “recent public sector frameworks / contracts, other than the CCS, all have 24 hour cancellation charges”. In other words – other contract holders have managed to convince interpreters to accept these dire terms, so we are going to use the same terms on you. But in Bristol we are challenging the assumption that companies can make their profits by cutting our income. In the words of the NHS: No decision about me without me! In December, interpreters from the region gathered together to talk about how we felt about this contract and what we wanted to do. This wasn’t a NUBSLI meeting, although many there were members. This wasn’t an ASLI meeting and this wasn’t a VLP meeting, although there were many there who were members of one or both. This was a meeting of professional colleagues looking to find a reasonable collective view about a pay scale and working conditions that had been imposed upon us without our input or opinion. The consensus from the meeting was that the terms of the contract were not acceptable. Our response was a collective letter to Sign Solutions, and individual emails to the Quality Director of one of the effected Healthcare Trusts, explaining why we couldn’t agree to work under the terms of the contract, and detailing what adjustments we would like to see put in place. Over 40 local interpreters have come forward and publicly declared their intention not to work under the terms of the contract. 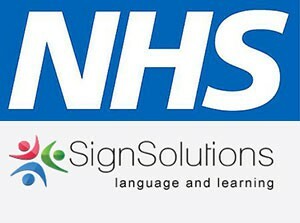 Despite Sign Solutions assuring us that their hands are tied by the conditions imposed by the contract client; that they are constrained by the ‘worst financial times experienced by the NHS’, they have already, once or twice, acceded to individual terms when they’ve needed to get an interpreter into a booking, with phrases such as ‘on this occasion’ and ‘for the sake of the client’. The 40 plus interpreters in this region will be standing their ground on this one. We know that by acting collectively we can make it clear that the contract can not be satisfactorily filled without our good will. And you don’t get our good will by degrading our professional worth. Sadly this contract has already claimed its first victim: a local deaf association has announced its closure. The income generated by its small interpreter bookings agency was what kept it going and it can no longer guarantee enough income to stay afloat without the hospital bookings. Without collectively standing together and forcing the agencies and contract holders to re-think their contracts, it will be sole traders like you and me who realize we can no longer guarantee enough income from the bookings on offer to pay the mortgage or the child care. And the businesses closing down will be ours. The damage being done to the profession by these dishonourable terms and conditions could be fatal.